The Workgate Manhole Barriers are strong, robust system, and designed with the contractor in mind.. The 4 Gate Workgate Barriers are strong, robust system, and are designed with the contractor in m.. The workgate barriers in the manhole barriers range from Manchester Safety Services range have all been produced to provide comprehensive protection against potential falls into open manholes. These helpful products are vital additions to many worksites and road repair jobs – helping to protect the work crew as well as the general public. Neglecting to provide adequate protection around an open manhole can violate due care laws and could land you and your company in significant trouble. Even if the manhole is far removed from public walkways and is not particularly deep - it is still important to provide sufficient warning and protection around it. The manhole barriers in the Manchester Safety Services range have all been designed to be highly visible and robust enough to withstand external pressures. 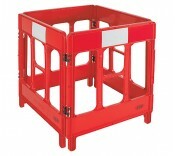 The simple-to-erect barriers can quickly provide exceptional cover around an open manhole. For more information about all the road safety equipment products from Manchester Safety Services, contact our dedicated team on 01706 364943.